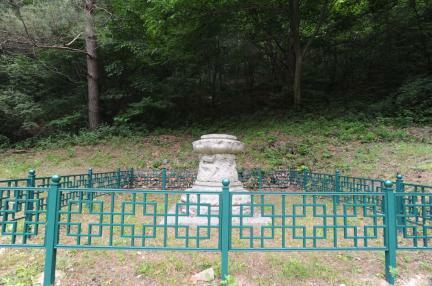 선림원은 해인사를 창건한 순응법사가 연 절로, 1948년 절터에서 연대가 804년으로 적힌 신라시대 범종이 나오면서 창건연대를 알 수 있게 되었다. 이 승탑은 일제강점기에 완전히 파손되었던 것을 1965년 11월에 각 부분을 수습하여 현재의 자리에 복원한 것으로 기단부(基壇部)만이 남아있다. 기단의 구조로 보아 8각을 기본으로 삼고 있는 승탑임을 알 수 있는데, 신라 때에 돌로 만든 승탑은 대부분 이러한 형태를 띠고 있다. 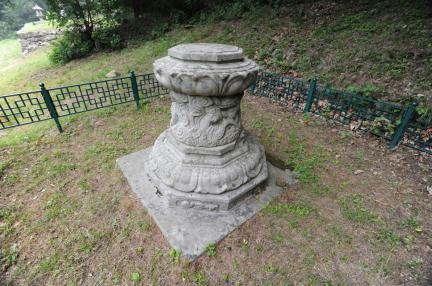 정사각형의 바닥돌 위로 기단의 아래받침돌·중간받침돌·윗받침돌을 올렸다. 아래받침돌은 2단인데, 아래단이 바닥돌과 한 돌로 짜여진 점이 특이하다. 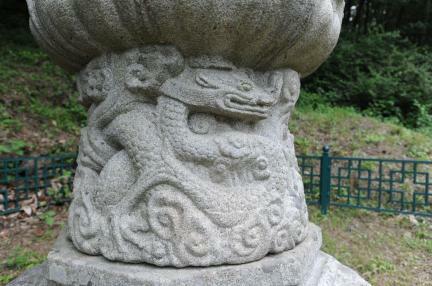 윗단에는 두 겹으로 8장의 연꽃잎을 큼직하게 새기고, 그 위에 괴임을 2단으로 두툼하게 두었다. 중간받침돌은 거의 둥그스름한데 여기에 높게 돋을새김해 놓은 용과 구름무늬의 조각수법이 매우 웅장한 느낌을 준다. 윗받침돌에 2겹으로 새긴 8장의 연꽃잎은 밑돌에서의 수법과 거의 같다. 기단의 위아래를 마무리하는 수법에서 뛰어난 안정감을 보이고 있는 승탑으로, 기단 아래받침돌 밑을 크게 강조한 것은 8각형의 일반적인 승탑양식에서 벗어난 것으로 통일신라 후기에 만들어진 것임을 알 수 있다. 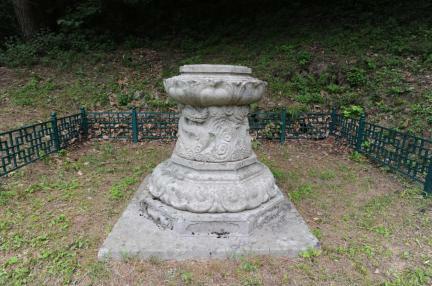 정확한 승탑의 건립시기는 절터에 남아있는 홍각선사비와 이 승탑이 홍각선사의 승탑인 점으로 미루어 신라 정강왕 1년(886)인 것으로 볼 수 있다. 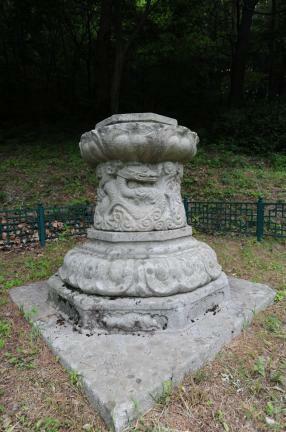 This stupa was restored in November 1965, having sustained serious damage during the Japanese occupation period. 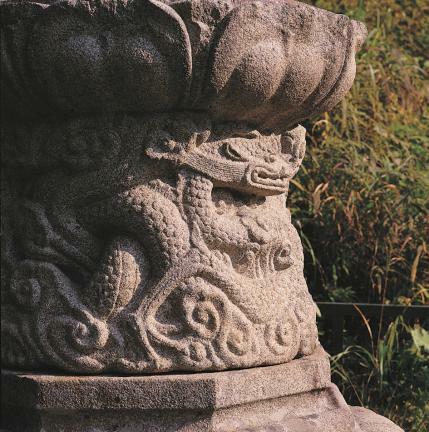 It is located at the former site of Seollimwon Temple, which was founded by monk Suneung, also known as the founder of Haeinsa Temple. 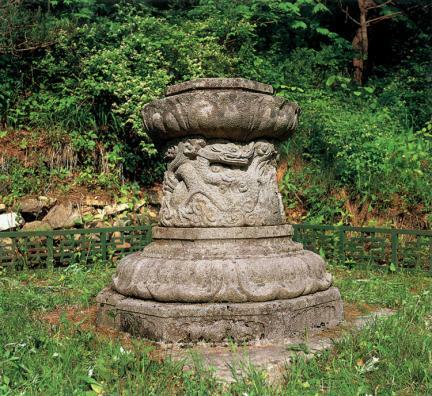 In 1948, the discovery of a Buddhist temple bell of the Silla period inscribed with its year of production (804) shed light on the date of the temple’s foundation, too. 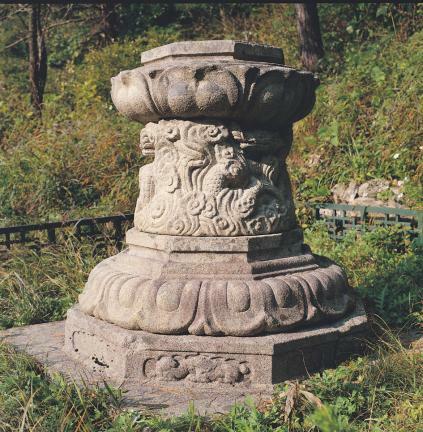 Judging by the structure of the stylobate, the stupa must have been octagonal in shape, which was the typical style of stone stupas during the Silla Dynasty. 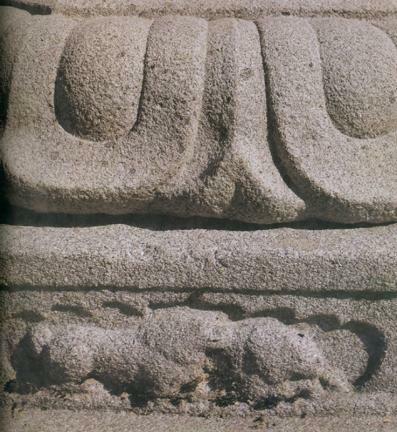 The stylobate, which rests on the square foundation, consists of bottom, middle, and top layers of stones. 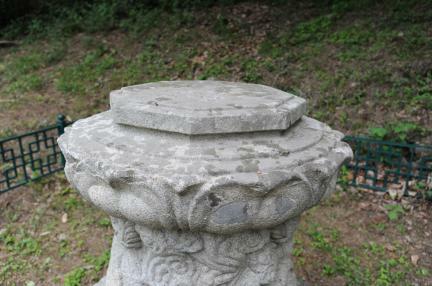 The bottom layer is composed of two tiers and, in particular, the lower tier and the foundation are hewn from one piece of stone. 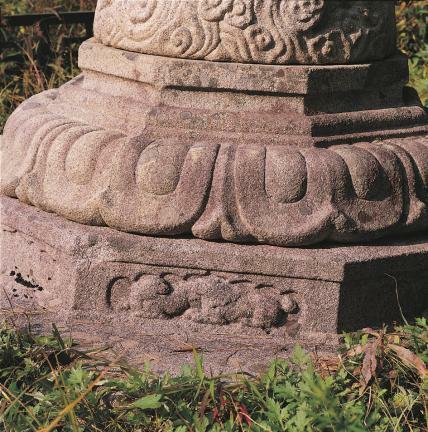 The upper tier is engraved with large patterns of doubled-eight lotus petals on which the thick two-tiered supporting stones are placed. 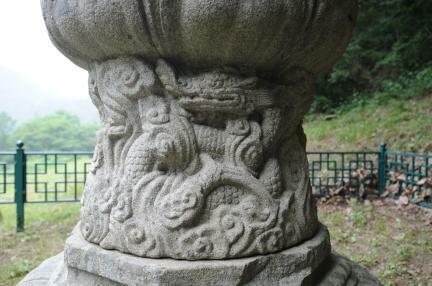 The middle layer of the stylobate is almost round and is splendidly carved in relief with dragon and cloud patterns. 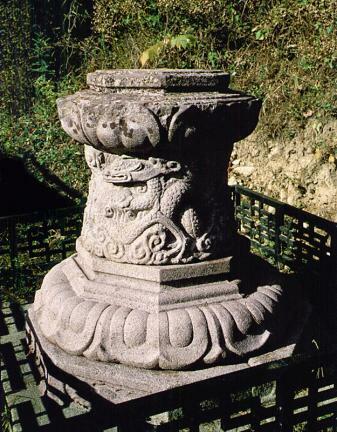 The top layer of the stylobate is engraved with a design of doubled-eight lotus petals similar to the pattern on the upper tier of the bottom layer. 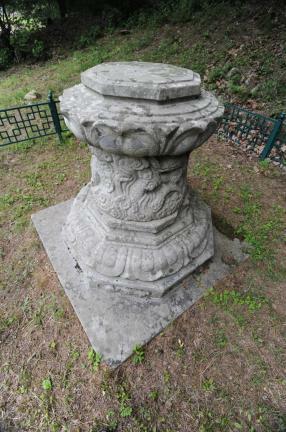 The stupa displays a stable appearance due to the finishing technique applied to the top and bottom layers of the stylobate. 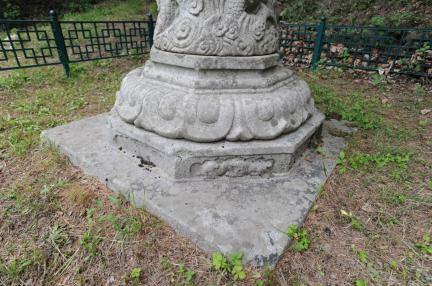 Judging from the accentuated bottom layer of the stylobate, the stupa marks a departure frmo the general octagonal style, and must have been built during the late Unified Silla Period. 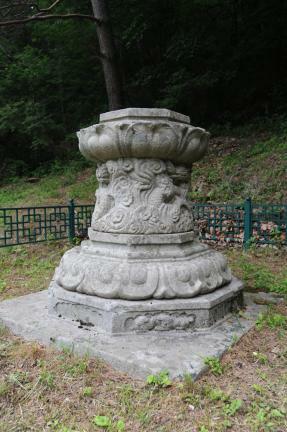 It is assumed that the stupa was erected in or around 886 (the first year of the reign of King Jeonggang of the Silla Dynasty) as the Stele for Master Honggak, which is also at the temple site, was erected in 886, making it likely that this stupa was erected for Master Honggak too.